Welcome to Cozumel Mexico . . . Known primarily as a Mecca for scuba divers, the truth is that they make up for roughly a third of Cozumel vacationers. When you arrive on Cozumel island, the first thing you will notice is the myriad of cruise ships and ferries shuttling people to and from the mainland. Cozumel is a very popular destination. 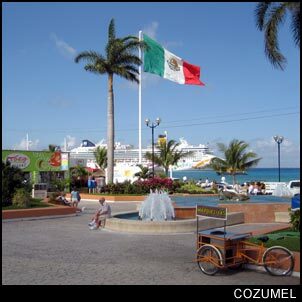 The scoop on Cozumel as a vacation destination is that it is what it is for a reason. World class diving brings the divers . . . cruise ships bring the shoppers . . . and the ferries bring people from the mainland who want something to see and do for the day. As a non-diving vacation destination, however, I would have to recommend against it. The options for things to see and do are better if you are based on the mainland. Shopping : As part of Mexico's duty free zone, cruise ship passengers may find the allure of shopping too powerful to resist. Remember, even though most of the Jewelry stores look like retail outlets, everything is negotiable. Sales people are very good at sizing people up and figuring out how strictly they will adhere to the listed prices. -- Shopping tip; if you are here to shop, dress down . . . buy a cheap $5 watch, get rid of the jewelry and the designer labels. Look like you couldn't afford to pay what they are asking and try to get them to come down on the price. Scuba diving : You don't need to make reservations for anything. There are more dive operators here than you could shake a stick at and boats leaving for all points around the island are continuously leaving from somewhere. All you need to do is to walk around the area near the docks, pop your head into a dive shop and ask what they have leaving for where and when. It the time (or price) doesn't suit you, just go to the dive operator on the next corner. Beach lovers from the mainland : If you are in Cancun and would like to hang out on an island in the Caribbean, go to Isla Mujeres. If you are in Playa del Carmen or Tulum . . . your beaches are better. However, the same holds true about the island experience . . . Isla Mujeres is not that far away.